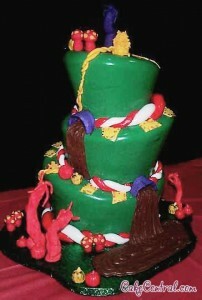 This cake style is often referred to as “mad hatter cake”, topsy-turvy cake, whimsical cake, titled cake, or slanted cakes. 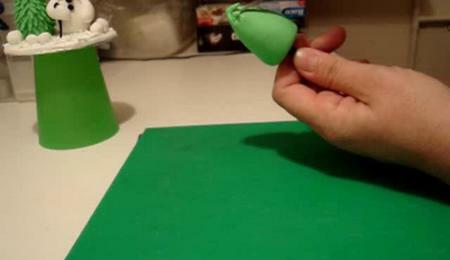 This technique is a fun optical illusion that makes your cake appear topsy-turvy. I finally got an interesting project to demo and a working camera all at the same time. People ask me all the time how I do the topsy-turvy Mad Hatter ish cakes on my site and how on earth I get them to the customer site without a disaster. I know there are lots of folks out there doing lopsided cakes and using various forms of construction, but this particular method is what I came up with to suit my needs. Some background. First thing to know is that I HATE setting up cakes on site. When I’m working in my own place, if I happen to drop a dollop of icing or drizzle some chocolate on the table, it’s no big deal. Just clean up and keep going. But at a reception site you have to work on a table that’s already dressed, and the extra pressure of trying to work super clean to avoid mussing the tablecloth pretty much guarantees that I’m going to leave a spot dead center in front of the cake. So my preference by far is to assemble the entire cake at home, drive it to the site, walk it in, set it down, and disappear. I can’t always do it — separations are a problem, and some cakes are just too darned heavy to carry by myself once they’re all assembled — but most of the cakes I do arrive with no assembly required. The fact that I’m a big guy and can carry a 150+ serving cake all assembled sure helps in that regard. 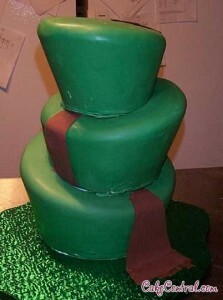 This particular cake wasn’t for a wedding, but rather a birthday party. The youngster’s parents rented out a movie theatre for a private showing of the new “Charlie and the Chocolate Factory” movie, and wanted the cake to be reminiscent of the movie. Since this was opening weekend of the film, I obviously wasn’t able to see it in advance, so I had to rely on some stills from the movie website. 1. 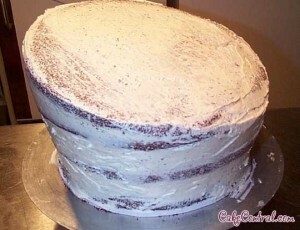 First, for the topsy-turvy cakes, I like them tall, and I like them to taper such that the base of each tier is smaller than the top of the tier. That helps to add to the appearance of instability.For each tier, then, I bake 3 2″ layers in graduating sizes. 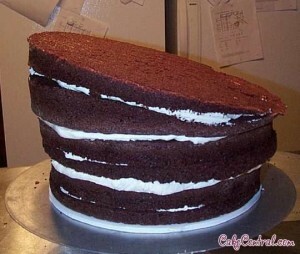 This is a 3-tier cake, and the sizes I’m using are 6-7-8, 8-9-10, 10-11-12. I.e., the top tier consists of a 6″ layer, a 7″ layer, and an 8″ layer, etc. I think the proportions work well when the largest layer of one tier is the same size as the smallest layer of the tier it sits on. (The 6-7-8 top tier sits on top of the 8-9-10 middle tier which sits on the 10-11-12 base tier). Make sense? Base tier is chocolate, and the middle and top are white. 2. The 10″ and 11″ layers of the base tier get torted as normal. 3. 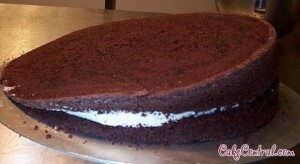 Then assembled with a buttercream filling. I’m taking a hint from chefpeon here and building this part of the tier upside down (thanks, Annie!). I used to stack the smallest, then the middle, then the largest layers, which makes for some floppy edges to deal with. This way things stay where you want them until it’s time to trim and clean up. I don’t place the 10″ layer dead-center onto the 11″ layer on purpose. The slant that lends helps with the illusion. 4. 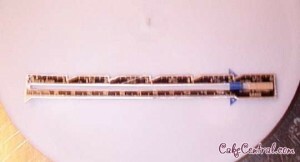 The 12″ layer gets torted at an angle. I don’t worry about super precision here since imperfect angles just add to the effect. I just hold the knife at the top edge on one side and aim for the opposite corner. Here’s a slightly better shot showing the cut angle. 5. When I fill and reassemble this layer, I rotate one of the pieces so that the thicker sides are together. 6. Everyone goes back in to chill a bit and set up the buttercream. Then remove both pieces, flip the 10-11 part to put the 10″ part on the bottom, slap on some more buttercream, and place the angled 12″ layer on top (top secret recipes hanging on the fridge — no peeking!). 7. I use a sharp knife to clean up the sides a bit and get rid of any corners sticking out, then give the whole thing a crumb coat and stick it back into the fridge. 8. 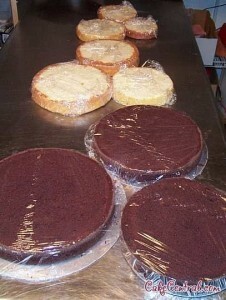 Repeat steps 2 – 7 for every tier of your cake.Here are all three cake tiers assembled, cleaned up, and crumbcoated. 9. OK, big secret number one: The topsy-turvy thing is an optical illusion. 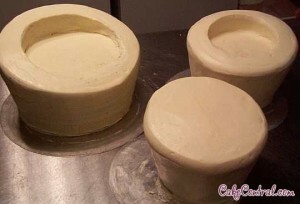 Each tier is actually sitting on a flat surface, just like a regular wedding cake.The question is, then, now that we’ve made all these angled cake tops, how do we come up with a a flat surface to set the next tier on? Start cutting, baby.This is the 10-11-12 tier. On it will sit the 8-9-10 tier, so I need to make an 8″ round flat spot. I take a cake cardboard (or pan or, in this case, cheesecake pan insert) and set it on the tier where I want the next tier to sit. 10. 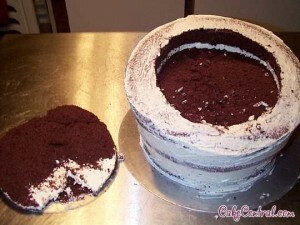 I then cut vertically into the cake, all the way around the circle. 11. 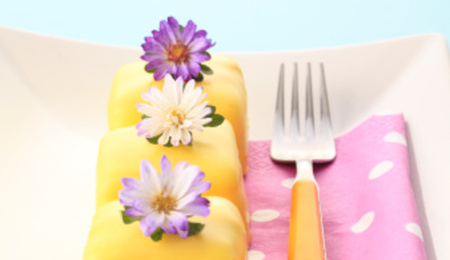 Spread buttercream over the now naked surfaces and re-chill. (Note to self: next time no matter how late it is and how tired you are, don’t just try to slap icing onto a freshly cut chocolate cake unless you really DO want crumbs in the icing ). After it’s chilled, I’ll use my impeccably clean hands to finish the smoothing (thanks again, Annie). 12. OK, here are all three tiers. Two have been modified to create a shelf for the next tier up. Obviously, the top tier doesn’t need this since it’s the top. The modified tiers always make me think of a baseball stadium. 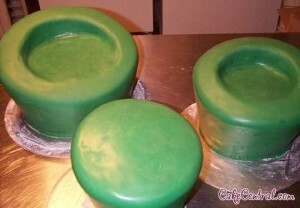 13.Now cover with fondant. In this case they’re all green because I was going for the look of the inside of the chocolate factory, with the rolling green hills, chocolate river, and candy plants.Typically I’ll use 3 different colors, then mix and match those colors for accent pieces. 14.Prep the board. I use 1/2″ foam board for pretty much all my bases. Lightweight, strong, and easy to cut with a utility knife to the size and shape I want. 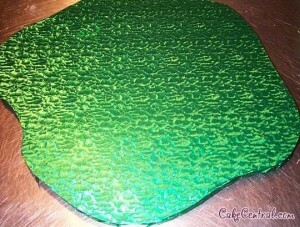 Here it is, covered in green foil.I also use foam board instead of cake circles as a base for each tier. For this, I use the 3/16″ thickness. Plenty sturdy to hold a tier – even up to 20″ or more — and WAY less likely to flex or collapse than cardboard cake circles. 16. 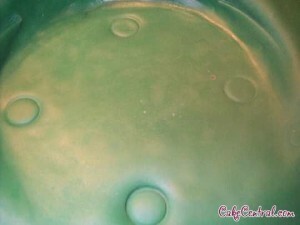 This is my favorite assembly method for tiered cakes. It’s called the Single Plate System from Bakery Crafts. The legs fit very snugly into the fittings on the bottom of the plate, and the whole assembly pushes down into the supporting tier to make a very stable platform for the next tier to sit on. The legs are 9″ long, so they’re a good height if you’re doing separations. 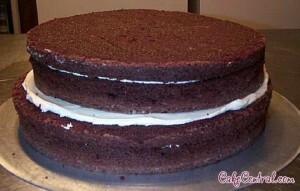 Most of my cakes are stacked, though, so I cut them. 17. 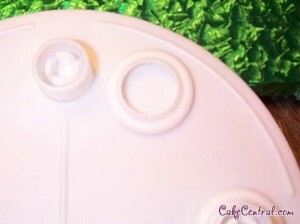 When I’m stacking a cake, I like to remove the ring around each of the fittings in the bottom side of the plate. It lets the assembly push down into the supporting cake without displacing any more cake than we have to. That ring look familiar? That’s what I use for feet under the base. I always wind up freeing up more of them than I use on any given cake, so I’ve now got a bucket full of them. Maybe I should start selling them! 18. After removing the rings, place the plate atop the tier it’s going to sit on and pretty gently to mark where the legs will go. This will help later to line up the legs and make sure they’re going in straight. Also gives you a place to measure the height of the tier. I use a hemming ruler to measure the height and mark my legs for cutting. 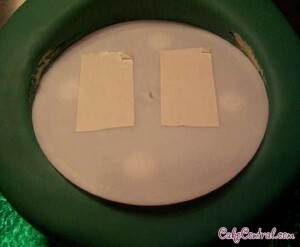 Just stick it straight in to the cake where one of the leg marks is, slide the little marker thingy down to the top of the cake, and extract. 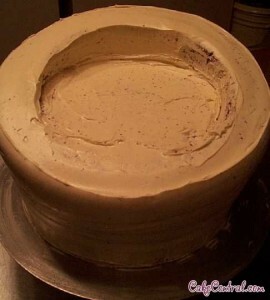 I usually then subtract another 1/8″ to make sure the plate will sit snug on top of the cake and not sit up at all. 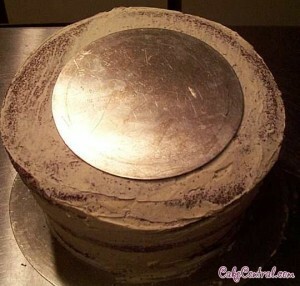 In this case the height of the cake came to exactly 5 inches. I’ll let you believe that I planned and executed perfectly to make that happen if you like. 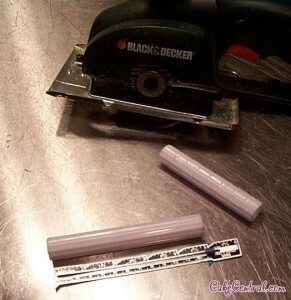 19.Cut the legs to the measurement you need. I use my adorable little battery-powered circular saw — my dad would be so proud (sniff). If you don’t have one, you can use a hacksaw.Make sure to clean off any residual plastic oogies left by the saw, and WASH THE LEGS THOROUGHLY. Don’t want to leave little plastic bits in the cake. Ick. 20. As added protection, I make sure the cut end is the one that gets inserted into the plate, just in case. 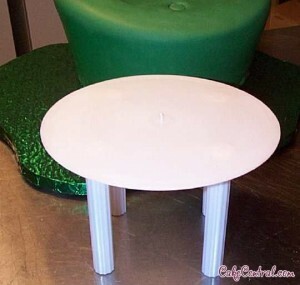 Stick the legs firmly into the plate, and your assembly is ready to go into the cake:Line up the leg bases with the marks in the cake and press gently but firmly to insert the little “table” all the way into the supporting cake. 21. Big secret number two:Carpet tape.I get the “high traffic area” 2-inch wide stuff. 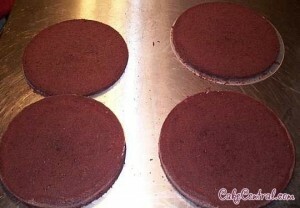 A couple strips go down onto the base, and the bottom tier is stuck down. Then a couple strips go on top of each plate before the next tier gets placed on. 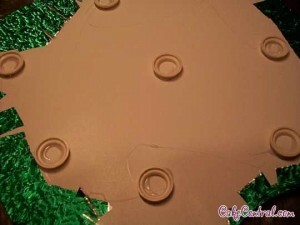 Do make sure to start peeling the backing from one corner before sticking it down. It’s much easier than trying to peel it once it’s on the plate:Note that when I inserted the plate assembly, I mucked up the fondant on the inner vertical part of the stadium. That’s going to be hidden by the next tier, so it doesn’t worry me too much. In order to get the plate as snug as possible into that curve, you almost have to do a little damage. 21. 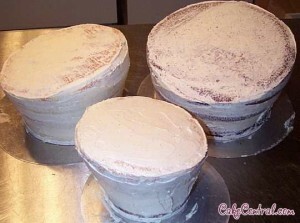 Here are all three tiers stacked and ready for decoration. I like to turn the tiers so that each one looks lopsided, but the overall effect is balanced. I decided it would be easier to get the chocolate waterfalls in place as I was stacking rather than trying to fit them in after the fact. 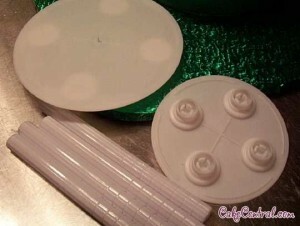 There’s another on that you can’t see emanating from a pool on the top tier going down the back side to the middle tierFor a border, I usually make a bunch of balls of rolled fondant of varying sizes. These are then placed at the base of each tier such that the largest ball sits at the highest spot of the supporting tier, and they graduate down so that the smallest ball is at the lowest spot. Helps add to the illusion. This time, though I wanted the peppermint stick effect, so I made snakes of rolled fondant in red and white, thinner at the ends and thicker in the middle (like a snake that’s just had a meal! ), then twisted them together and wrapped around the base of each tier, fattest part at the high side of the supporting tier, thinner parts at the low side. 22. Here’s the finished product after decoration and delivery. I made a bunch of odd trees, mushrooms, bushes, pumpkins, vines, and stepping stones from colored modeling chocolate. Same for the spouts that the chocolate is gushing from. I decided that the waterfalls looked too flat, so I went back and painted more chocolate onto the surface to make it look more like it was flowing. The lighting on the photo isn’t terrific because it was in a movie theatre where the lights are always somewhat dimmed. 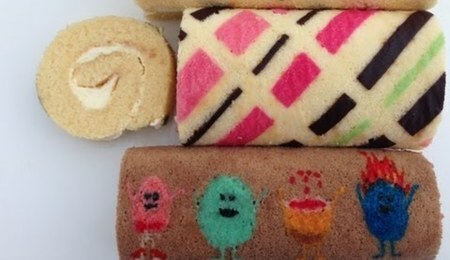 The photo links are all broken :( this looks like a great tutorial! There are NO photos here. I would love to see the whole tutorial because it sounds like it is wonderful! No pictures :( i saw this when there was pictures and it was fantastic!! Please repost pics, we appreciate your help! I would l;ove to see the photos too! I would love to try this, however, the instructions are slightly lost on me without pictures. Is it possible to correct the problem? Can you please post the pictures too? As others before me I'd love to see the photo's. Could you put them back up? As with most of the most recent postings - the instructions are great but photos would help a lot! would it be possible to get these re-instated? But where are your photos? Can you put them again? Awesome instructions. Thank you so much! How many does this cake feed? I really should have read this before attempting one on my own from just a youtube video.....disaster was inevitable but now i will make a better one. Thanks for the great tutorial. Does anybody else despise these abominations as much as I do..??? I have yet to see one which impressed me. Tons of work and poor return. 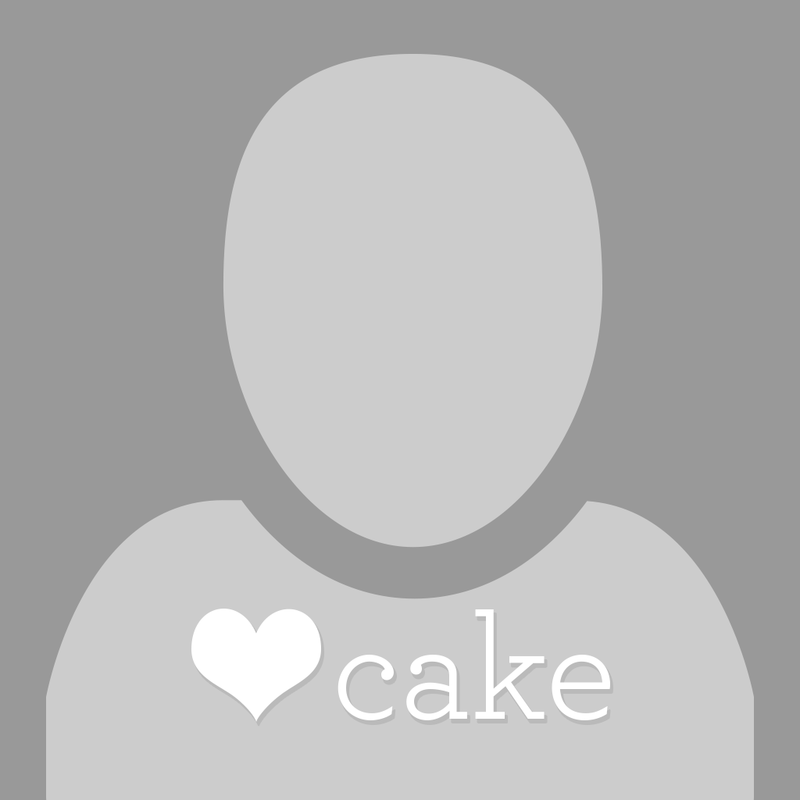 I look forward to them fading into obscurity..along with Russian tips and cupcake cakes.